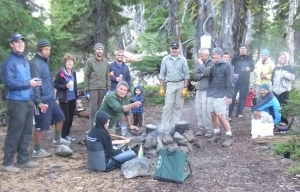 Six of us headed out from our Luau base camp at The Tarns shortly after 9am: Fritz, Nathan, Paul, Adrian, Joanna, and Siena. John was already on the route, leaving earlier and expecting us to catch up. Paul had already ascended Broken Top the day before, and Adrian headed up partway just to guide us. The day before, they had stayed low on the north side of the West Ridge and had a lot of trouble getting up onto the ridge; on the way back down they had stayed on the crest of the ridge, and found a much better route. Adrian guided us fairly directly up to the crest of the ridge, far to the west, and it was an excellent route - very gradual, no obstacles, and a nice soft walking surface. It did mean that we had to skirt around the prominent horn on the ridge just before the saddle. Adrian turned around before the horn to hike out with his carpool, and the rest of us went around the south side, picking our own trail and losing as little altitude as possible. While it was probably the most challenging terrain of the climb, it was only a few minutes before we were on the standard climber's trail up the ridge from the saddle. We reached the nose, the usual crux of the climb, and I free-climbed that section, tying off at the bottom to avoid a precipitous fall should anything happen. But nothing happened; I've done that pitch a lot. Though we had watched John all the way up the ridge, we didn't catch up to him until the nose, and not knowing the usual route, he had already explored several alternate routes to the summit. In past years there has been a large boulder at the top of that pitch that was the traditional anchor; this year, it was gone. Fortunately where it broke off, it left a secure slab that was pretty easy to set an anchor on. I set a new webbing anchor, using the one left from the day before for a backup, and belayed the team up the nose. As we were belaying, a group of three hikers arrived with a silly little static line for their rope, so I belayed up their leader and left our rope there for them to use. We didn't feel it necessary (and barely effective) to protect the summit block section; we just moved along slowly and carefully, using both feet and hands, and being careful. We reached the summit right around 1pm. It was a beautiful sunny day, with a nice breeze. We spent about 20 minutes on the summit, and then descended. The hikers said they were fine getting down with their rope, so we rapped out and pulled ours. We descended the same route that we had ascended, getting back to camp about 4pm.